I’ve been thinking of this post for two or three weeks — another pilgrimage reflection — a bit of humor. A visit to the Church of the Nativity in Bethlehem — the place where ‘the little Lord Jesus lay down His sweet head — away in the manger.” Here our group was divided in half as we awaited our appointed time to enter the Grotto of the Nativity to celebrate Mass. As we waited, our leader, Fr. John Abela, corralled us around like his flock of sheep — come closer. We were in the midst of a great amount of iron scaffolding. 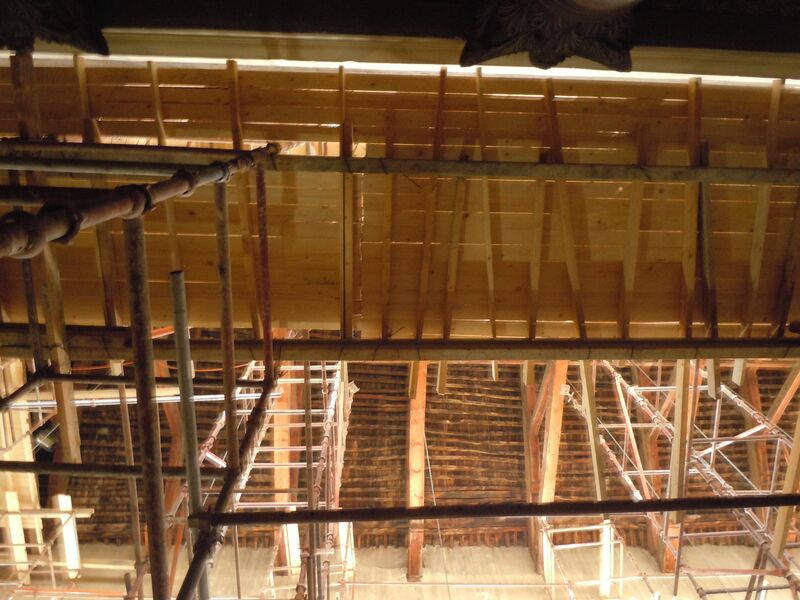 The scaffolding surrounded the perimeter of the church interior and reached high into the rafters — the church that sits over the Grotto of our Jesus — the Star of Bethlehem. Fr. John gestured our gaze up to the ceiling and declared, “You are looking at a miracle!” We were curious. He continued with great drama, “You are looking at a miracle — the roof is being repaired! It has been 70 years under discussions.” What? Really? 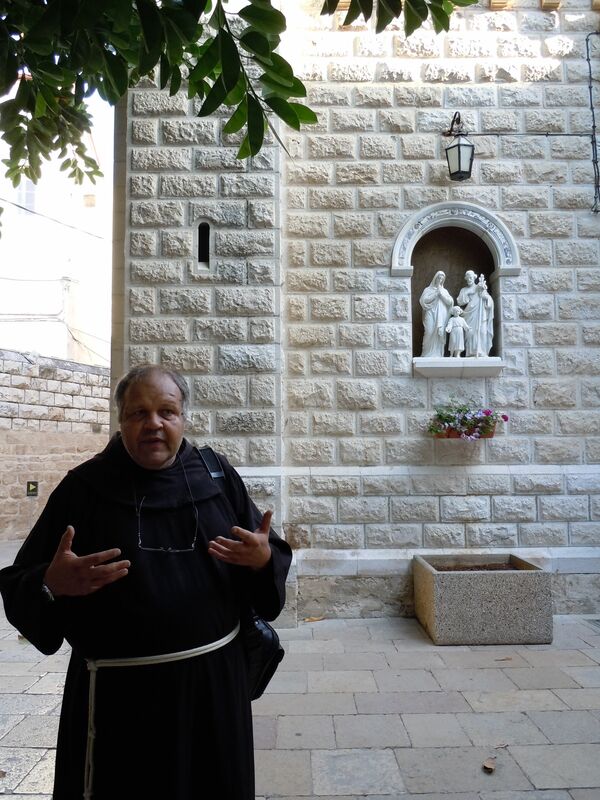 The Church of the Nativity shares its custody with the Greek Orthodox, Roman Catholic (Franciscan Friars), and Armenian churches and are under a “status quo” arrangement that requires an equal sharing. It is like walking into a house and each room is decorated by designers of completely different tastes. We await our appointed time for Mass as we only have 20 minutes and must start on time. If we are not on time we will be in the “report” at the end of the week when they review “time.” Really? I found a current article on the topic that is titled “Warring clergy unite to repair leaky roof in Church of the Nativity.” Warring clergy? Really? Not the Franciscans. It is an interesting conundrum — no doubt — but “squabbling over who cleans what?” Apparently cleaning something can be construed as ownership and all things being equal — well — neither of the Christian churches would want the other to claim they alone paid for and repaired the leaky roof. It is so complicated. I think of Fr. John Abela as I read this article and can almost hear his laugh. Just before Thanksgiving we learned that Fr. Abela had suffered a heart attack in Rome. Just yesterday, we learned that he had untimely (in our eyes) passed away on Sunday, Dec 19th — the Fourth Sunday of Advent. He will be buried in his home country of Malta on Christmas Eve. It amazes me how, even weeks beyond the end of our pilgrimage, the significance of our relationships continues to unfold. We were most blessed and graced to have been Fr. 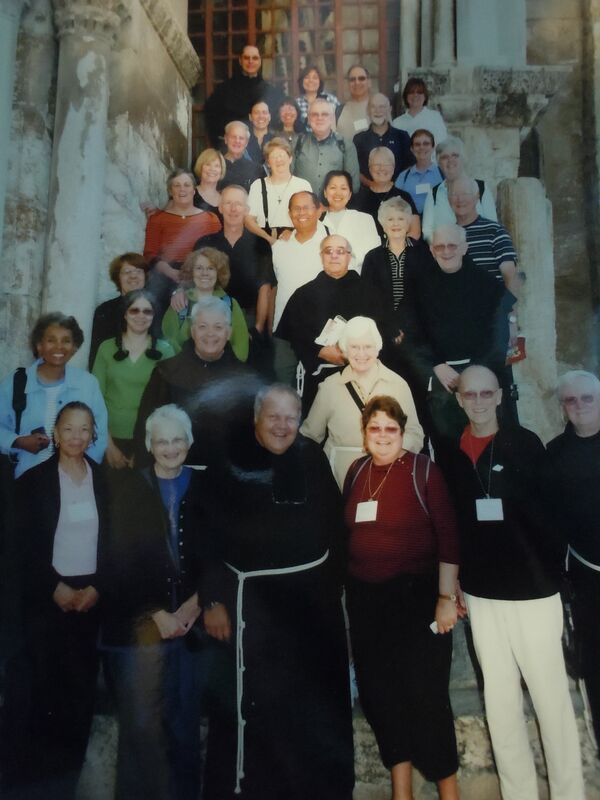 Abela’s last Holy Land pilgrimage group. Sometimes people cross our paths for only a minute, hours, or days and yet they leave an unforgettable mark. I think of the times I moved closer so that I could hear all that Fr. Abela was telling us. His love and knowledge of the Holy Land so apparent. I think of the holy hour he led at the Church of Gethsemane — the thought provoking reflections on the Gospel accounts of the agony in the garden. Had I known Fr. Abela would soon leave this world, would I have listened even closer? Would I have made sure to take my journal and make notes. I think of the disciples who were sleeping in the garden — specifically asked to remain awake and watch while Jesus prayed. Had they known what was about to unfold, the kiss of betrayal, would they have slumbered any way? So, Fr. John Abela will be interred on Christmas Eve — the Eve of the Star of Bethlehem. At least the Star of Bethlehem is getting a new roof — and maybe now a Friar to watch over it all. The below photo was taken in Nazareth on October 27th, 2010. It is iconic of our pilgrimage — Fr. Abela gesturing as he taught us so much. The Holy Family is watching over him. This entry was posted in Catholic, Church Life, Franciscan and tagged Bethlehem, Catholic, Christian, Christmas, Franciscan, Holy Land, Jesus, Pilgrimage. Bookmark the permalink. Thank you so much for sharing his words. “Guide them to His parties!” So true. It is all so hard to comprehend other than to know we were truly blessed. We followed him all over the Holy Land like little disciples not knowing he would soon be called to the Eternal Kingdom. Just a note to any of our pilgrims who stop by here. Fr. Abela’s sister has contacted me for any photos you have. You can email me and I will get them to her. Our pilgrim photos were the last photos of her brother before he was hospitalized.